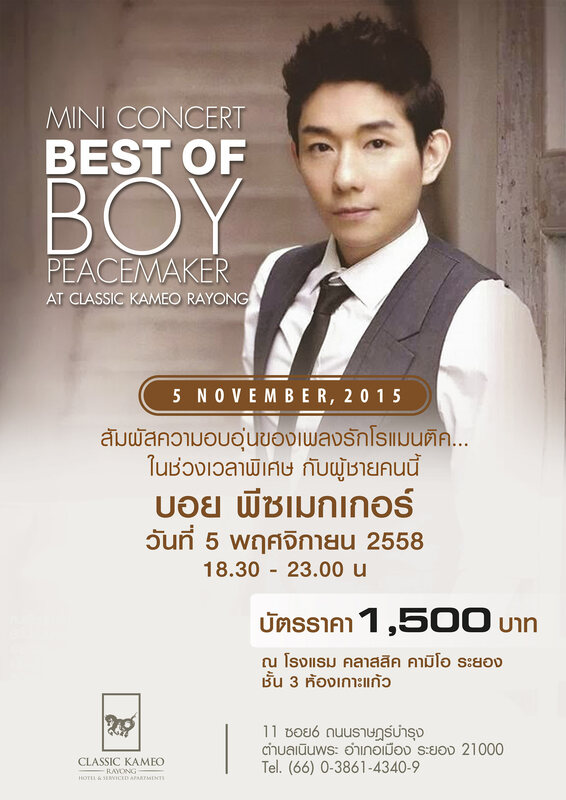 On 5 November from 6.30 p.m. to 11 p.m., join us for an evening of merriment and melody with Boy Peacemaker, during a special mini concert held in the Korkaew Room on the third floor of Classic Kameo Hotel, Rayong. Witness the magic as Boy Peacemaker sings ‘Tied Heart,’ ‘Missing You,’ ‘Love,’ and other popular songs. Tickets are only baht 1,500, a small price to pay for an evening of romance at Classic Kameo Hotel, Rayong. For more information please contact Classic Kameo Hotel, Rayong at tel: 038-614-340 or visit the website at: www.kameocollection.com. วันที่ 9 ตุลาคม 2558 เวลา 17:49 น.